The past revisited and the 2012 season in detail! NICO Rosberg is on cloud nine following his maiden success in Shanghai last weekend and momentum is a key word in Formula One. So the German picked up where he left off in Sakhir to end up quickest driver today in the opening two practice sessions for Sunday’s Bahrain Grand Prix. 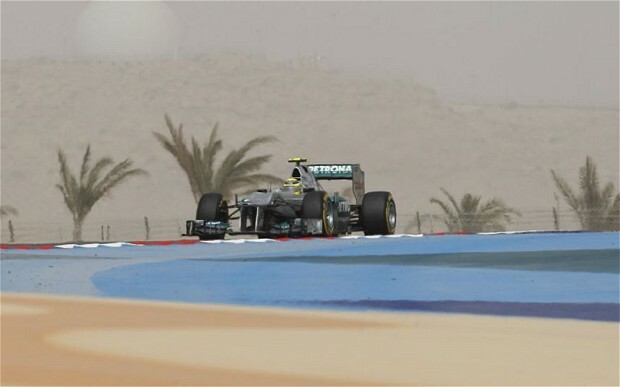 As the sport is forced to deal with a very unstable environment, Rosberg and Mercedes GP did their talking on the track. His fastest time of 1.32.816 was nearly half a second quicker than Mark Webber in the afternoon session. Consistent pace on a long race simulation towards the end of FP2 suggests that the team’s tyre wear issues don’t seem to be such a nightmare issue as it was in the first two races. Red Bull have gone for a standard exahust configuration setup after different variations for both Webber and Sebastian Vettel. The Australian was marginally faster today, although the 0.3secs difference at the end of the session flattered the closeness between the pair. Vettel was second quickest this morning and third fastest in the afternoon. Championship leaders McLaren have never won the Bahrain Grand Prix, but will still probably be marginal favourites going into tomorrow’s important qualifying session. Lewis Hamilton was the pacesetter this morning and content to work on race setup this afternoon, ending fourth fastest. Team-mate Jenson Button didn’t seem as settled with the balance of his car today, but was still amongst the top six in both sessions. Once again, Ferrari lacked the ultimate pace as Fernando Alonso managed eighth and Felipe Massa twelfth in the afternoon session. Sauber ran excellent race simulations and both Sergio Perez and Kamui Kobayashi ended up in the top ten. However off-track politics continued to be the dominant landscape today. In midweek, clashes between Bahrani police and protesters over the running of the country almost led to a tragic incident involving the Force India team. Four of their team mechanics had petrol bombs thrown at them and two of them have flown back to the UK. With other team members expressing concern over their safety of leaving the circuit at dusk, the team elected to pull out of the second practice session on safety grounds. Personnel from the Sauber team also were caught up in flare ups in the Manama region last night and it is reported that Mercedes GP have requested moving to a hotel closer to the circuit to be further away from the protest. With Amnesty International and Labour leader Ed Miliband among those today who added their voices to the demand in calling the Grand Prix off, the king of F1 Bernie Ecclestone and the Crown Prince of Bahrain had to face some akward questions from a hungry worldwide media circus. Both have said that the race will go ahead as scheduled on Sunday, although you get the sense that the racing will disappear into obsecurity all weekend. Mercedes GP and McLaren look set to lead the way in qualifying tomorrow again, but the region’s issues might have more severe implications as the weekend progresses. Hello, I am Simon, 29 and currently work as a Picture Researcher & Product Editor for Topps Europe Ltd. In my spare time, I run the Premier League at 25 Website. I graduated from the University of Northampton in 2012 with a 2:1 degree in BA Hons Journalism. Posted on April 20, 2012, in Practice Reports and tagged Bahrain, Bernie Ecclestone, Ed Miliband, force india, mark webber, McLaren, Mercedes GP, Nico Rosberg, Red Bull, Sauber. Bookmark the permalink. Leave a comment. No more updates on 2012! !